KNYSNA NEWS – The world is getting hotter and drier and there are more wildfires than there have ever been. All over the world, from Portugal to California, Mexico, Australia, Indonesia and South Africa, wildfires are killing more people and livestock and burning more property to the ground. Scientists who study the weather believe that as the world gets hotter and drier, wildfires will take place more often and cause more damage. This is as likely to happen in the Western Cape as it is anywhere else. And it’s not only the scientists who are saying that the world’s climate is changing and that there is what we have come to know as “global warming”. “People everywhere are feeling the effects of this change,” says Tessa Oliver, project manager for risk reduction at Landworks – acknowledged experts in land management and fire awareness strategies. “Who can forget the devastating wildfire that consumed Knysna, Brenton-on-Sea and the surrounding area in June last year,” Oliver adds. That wildfire – the worst in South Africa’s history, fanned by 100km winds – left several people dead, flattened close to 1 200 homes, damaged 360 more from Sedgefield to Plettenberg Bay and destroyed 7500ha of plantations as well as burning down 17 800ha of fynbos and indigenous forest. Communities, especially those living in homes that are on the border between towns and wilderness areas, are the most at risk from unwanted wildfires. “The challenges faced by these communities include a lack awareness of what they can do to protect themselves,” says Oliver. Landworks has been appointed by the SA Insurance Association to conduct a “pilot” fire awareness project in Swellendam, Knysna and other vulnerable areas to alert and sensitise people to the risk that wildfires pose to their lives, their communities and their property, and empower them to help reduce that risk. The project will also create awareness about illegal burning and “mischief” ignitions that are being experienced according to local fire experts in the region. 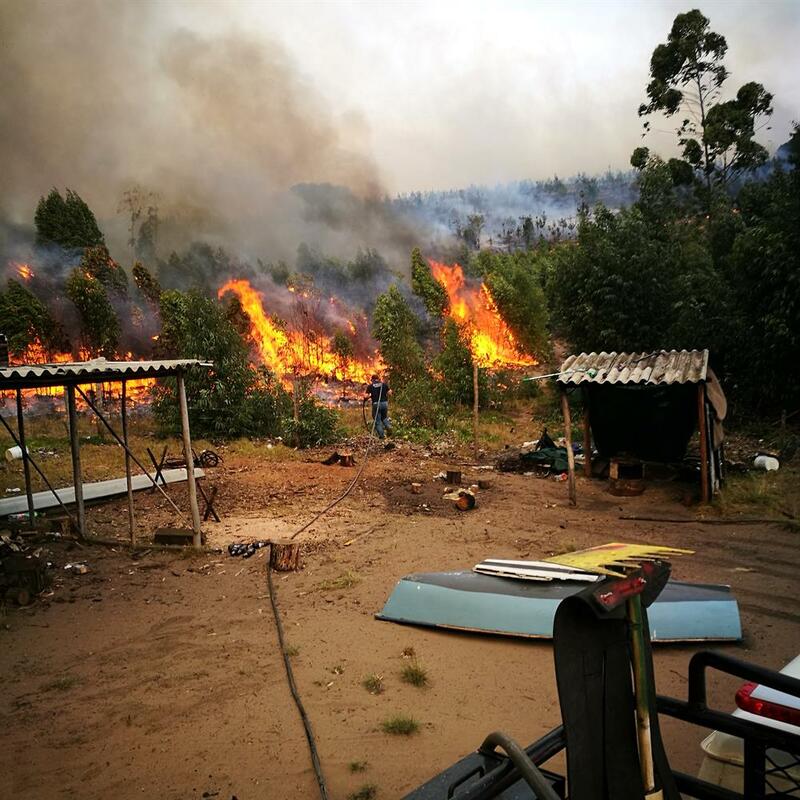 “There is no doubt that a significant factor in the intensity of the Knysna wildfire was the proliferation of alien invasive plants,” says wildfire expert Paul Gerber, fire adviser to the department of agriculture, forestry and fisheries. These plants introduced to South Africa from other countries are usually bigger and faster growing than South African trees and plants. They spread faster and take valuable water and space from our own, indigenous plants. They include pine trees, black wattle, long-leaved wattle, blackwood, kariba weed, bluegum, Port Jackson, and rooikrans – all of which burn hotter and more quickly than local plants. “These invaders have been a major driving force of unwanted wildfires in the area. And as the weather becomes hotter and drier, the invaders are likely to cause bigger, stronger and more damaging fires,” says Gerber. These plants introduced to South Africa from other countries are usually bigger and faster growing than South African trees and plants and much of it that burned down in the fires is already growing back. He warns that much of the alien vegetation that burned down in the fires is already growing back, and he says that the risk of fires will be even worse in five to 10 years’ time “if we do not remove or control these invaders”. By law, property and homeowners must prevent fire on their properties. This includes removing the invaders. People with invasive alien vegetation on their properties can be taken to court if this undergrowth catches fire and the fire spreads to other properties. This is the warning from Dr Hildegarde Fast, head of the Garden Route Rebuild Initiative that was established by the Western Cape Government to coordinate the recovery effort after last year’s fires. You can play a part in preventing this from happening by being aware of the dangers of unwanted wildfire, by removing as much of the “fuel load” as you can from your neighbourhood and simply by being aware. “In short, the message that ‘fire is everybody’s fight’ needs to be spread as far and wide as possible if we are ever to win the struggle to prevent the loss to life and property caused by unwanted wildfire,” concludes Oliver.